As a team, Miss Reesdale and Ginger Pryde were a success, which meant very big money. As separate personalities, neither was much of a box-office attraction, and Pryde fixed his spite on Miss Reesdale as a result of his sudden loss of fortune. The silence of Seaview Avenue, that bungalow-strewn byway of the select resort called Wellington-on-Sea, was undisturbed by Constable Smith as he made his way along its broad pavement. P.C. Smith was keeping a lookout for George Pryde, an ex-screen comedian. Pryde was double-jointed, and he had an almost unbelievable elasticity of countenance. There had been at one time something of a public demand for postcard pictures of his funnily or hideously distorted face. Miss Alice Reesdale, who was living alone in the little bungalow called the Retreat, in Seaview Avenue, had lately been receiving a series of these pictures through the post — unsigned and unaccompanied by any message. There is no accounting for the doings of practical jokers, but these pictures seemed to have special significance in Miss Reesdale's case. She was Pryde's former screen partner and fiancée, and, after their quarrel, he had made repeated threats that no other man should have her. His jealousy was fierce enough to make his sanity suspect, though people had been content to dismiss his fiery temperament as the natural complement of his red hair. It was a few minutes after midnight when the constable thought he saw a shadowy figure amidst the shrubbery surrounding the Firs, a somewhat larger bungalow than Miss Reesdale's, and situated at the end of the avenue, about a hundred yards away from the Retreat. He went to investigate, searched the grounds, and then, seeing a light in one of the front windows, knocked and conveyed his suspicions to the occupant, Mr. Herbert Foster. Foster was a bachelor, and his appearance would have been unremarkable but for his bushy black beard. "I can't be sure," said P.C. Smith. "Maybe it was the shadow of a tree or something. Anyway, there doesn't seem to be anyone about. Thought I'd tell you, as your still up, just to be on the safe side." "Thanks, officer," said Mr. Foster. "Have a drink?" While the policeman was in the drawing-room drinking a glass of sherry, young Henry Wheeler came in. Wheeler was the chauffeur-valet-butler to Mr. Foster, and it seemed to be a very pleasant sort of job. Wheeler's bearded employer gave him much more liberty than do most employers, treating him more as a member of the household. "Just been for a bit of a stroll along the seafront," said Wheeler, starting slightly at sight of the constable. Foster presently winked at the constable as, with easy familiarity, Wheeler helped himself to a drink from the sideboard. "It's love, Officer," he said. "I think that ex-actress, Miss Reesdale, has taken a bit of a fancy to the lad, but she hasn't quite made up her mind about him yet." "It isn't as bad as that," Wheeler said. "I can play the piano, and she thinks she can play the violin. I adapt the accompaniment to suit her timing, and everybody's happy." "Miss Reesdale, eh?" said Constable Smith, glancing more closely at Wheeler. "What d'you think of those postcards she's been receiving?" asked Wheeler. "D'you think Pryde really is meditating some rough stuff? I advised her to go to the police." "We're keeping watch for a while," said the constable. "You never can tell." "That collie of hers would give the alarm if she were attacked at night, I should think. Savage brute. Goes for everybody except her. And it isn't too friendly towards even her at times." The constable, still surveying Wheeler keenly, nodded. "That fellow Pryde gave her that dog," went on Wheeler, "just before the burst-up. I suppose that accounts for it not taking to her too well. Still wants its original boss." At this juncture P.C. Smith bade the two good night and returned to his vigil. Turning out into the darkened avenue, he made his way to the Retreat, and stood outside the garden railings of the little bungalow waiting for his sergeant, who would presently arrive to send him off duty. He had waited there for about ten minutes, when he was startled by a noise within Miss Reesdale's bungalow. It was the howling of a dog. Smith shone his torch through the kitchen window, and then, with the help of the sergeant, who arrived at this moment, burst open the back door. They found Miss Reesdale lying on the floor of the drawing-room amidst overturned furniture. Scotland Yard was notified in the morning, and Detective-Inspector Gray arrived later in a car belonging to his friend, Dixon Hawke, the latter's assistant, Tommy Burke, being at the wheel. Gray had been at Hawke's flat when the phone-message came through, and it was the circumstance of the mysterious postcards that had interested Hawke. "The first point of interest," said Hawke, "is why, if that collie was roaming free inside the bungalow, with the room doors open, didn't it arouse the neighbours with its barking? You say there had been a policeman patrolling the avenue for several hours, too. Why didn't he hear anything?" "This fellow Wheeler must have doped it," said Gray. "Wheeler? That chauffeur they say she's been friendly with? You're rushing things a bit, aren't you? Anyway, it will be known all right whether the dog was doped. It will be sick all day, and won't eat for some time." "Well, perhaps he just turned it out of doors." "Before the murder? Necessarily before the murder. What would Miss Reesdale have to say about that? If she'd been standing by to voice her protest there would have been a bit of a wrangle, which would have excited the animal and made it bark. "Another point," persisted Hawke-"The dog was found inside the bungalow. Is it your contention that, after he'd committed the crime, this murderer went chasing about in the dark to round up the dog? If so, to what purpose?" "Perhaps it didn't want any rounding up. It may have been waiting on the doorstep, eager to be let in." "And it went in when the murderer opened the door to come out, without making any fuss? Without attacking the man? Without even barking?" "What a man you are for digging up difficulties," he grunted. "Anyway, what's the dog got to do with it? It's proved that Wheeler had been on visiting terms with Miss Reesdale. Her maid can tell us that. They had informal musical concerts, and were friendly enough to have petty quarrels. He was jealous of her all right, and, what's more, he was not at the Firs when the murder was committed. What was he doing roving about at that time of night?" "What about the postcards she'd been receiving?" asked Hawke. "They used to be given away with film periodicals, and you could buy them in newsagents' shops. He may have sent those to put the police off the trail." Tommy had drawn the car up outside the Retreat, where stood a number of police officers. "What a very unintelligent thing to do," said Hawke before alighting, "seeing that Pryde was last heard of in America. Don't you really think he would have foreseen that Pryde would most probably have an alibi?" "I haven't overlooked that. I grant you it's one of the things that wants explaining. It occurred to me that Wheeler might have got to know Pryde's whereabouts through Miss Reesdale. He might have arranged it at a time when he know Pryde would have difficulty in proving an alibi. At a time, say, when Pryde actually intended visiting Miss Reesdale, Pryde might have written to her, and Wheeler might have got hold of the letter." "While you're juggling with all those mights, couldn't you include the possibility that Pryde might have been the murderer?" "Don't be sarcastic, old man. Of course I include the possibility. But for the moment, we don't know of Pryde's movements at the material time, whereas we do know something of Wheeler's." The visitors were greeted by the local superintendent, who, before leading them into the dead actress's bungalow, pointed to a collie which a maid was holding on a lead. "That's the only witness," said the officer with a grim smile. The animal growled and bared its teeth. "There's dog language," said Hawke, gazing at it half abstractedly. The others were puzzled at the remark, for he made it almost as though he were serious. "By Jove!" exclaimed the superintendent suddenly. "I do believe Mr. Hawke has some strange hypnotic power over dogs. Look." The collie, which was standing before the man from Dover Street, had pricked up its ears in perky fashion, and begun vigorously wagging its tail. Its tongue lolled out, and it whinnied faintly as it strained on the leash in Hawke's direction. Hawke put his hand out to pat its head and was almost bitten. The collie changed its tone and growled ferociously. "Treacherous!" exclaimed the superintendent. "Treacherous beast that. Always was. No, I'm afraid you haven't any dog-'fluence, Mr. Hawke." "Anyway," said Hawke, "I know enough about dogs to feel assured that it has not been doped recently." The party went inside the bungalow, and then proceeded to the Firs to interview Wheeler and his employer. Hawke had his first glimpse of the latter before arriving at the Firs, the superintendent pointing him out through the window of the Retreat as soon as they got inside. "Let's go and have a talk to Foster and Wheeler," said Hawke after glancing over the disordered room. Mr. Foster, whom they had just seen returning home from the seafront, was deeply concerned for Wheeler. "It's true," he said, peeling off his coat after the callers had been invited inside, "that he's only been in my service a few months, but he's a good lad, and I'm going to get the best legal advice for him." "You didn't engage him here in Wellington?" queried Gray. "No," answered Foster, "in London. I advertised just after returning from Paris. I'd just sold out some business interests there, and I came here for a bit of a rest." The visitors then interviewed Wheeler who, white-faced and troubled, was going about his duties in the kitchen. "I couldn't have done it," he protested. "I couldn't possibly. That dog would have torn me to pieces, I tell you. It doesn't like me, and she used to have to chain it up every time I went there, and it usually barked until I'd gone. Its barking used to interfere with our music." It was certainly a strong point in his favour, but a little later Gray had triumphantly discovered a stronger point against him. A search of his belongings brought to light several of the picture-postcards such as had been sent to terrorise the dead woman. "These wore never posted," said Gray when he discovered them in the pocket of one of Wheeler's coats. "You overlooked 'em, eh? Didn't know you still had some left?" This, indeed, seemed to be the case. Wheeler went pale, stammered, and then made an unconvincing protest that he knew nothing about them. Wheeler was arrested, and Gray returned to Scotland Yard, Hawke having decided to stay on at Wellington-on-Sea for a while. He and Tommy engaged rooms at the Esplanade Hotel, and it was in the lounge there that Hawke saw an aspect of the case which his Scotland Yard colleague had missed. "When you look at the question of motive, Tommy," he said, "you will find that Pryde, the indiarubber man, had quite substantial reasons for anger against Miss Reesdale. "Quite apart from jealousy," he went on, "there's the money aspect. No small matter that. As a team, Miss Reesdale and Ginger Pryde were a success, which meant very big money. As separate personalities, neither was much of a box-office attraction. Miss Reesdale didn't trouble much about this, it seems, and it's reasonable to suppose that Pryde would fix his spite on her as a result of his sudden loss of fortune. "He's dropped right out of films and hasn't been heard of lately. No one knows where he is, so what's wrong with supposing that he might be here?" It was in the evening, after dinner, when Hawke made this pronouncement, and then he despatched Tommy on an errand, and made his way to the Firs. Foster was alone, and, having admitted Hawke to the drawing-room, he stood with his back to the fireplace and his hands thrust in his jacket-pockets. "Well, Mr. Hawke," he said, "what do you make of this business? Do you think we can do anything to help young Wheeler?" "Everything depends on what this indiarubber man might have to say for himself if and when he's found," said Hawke. 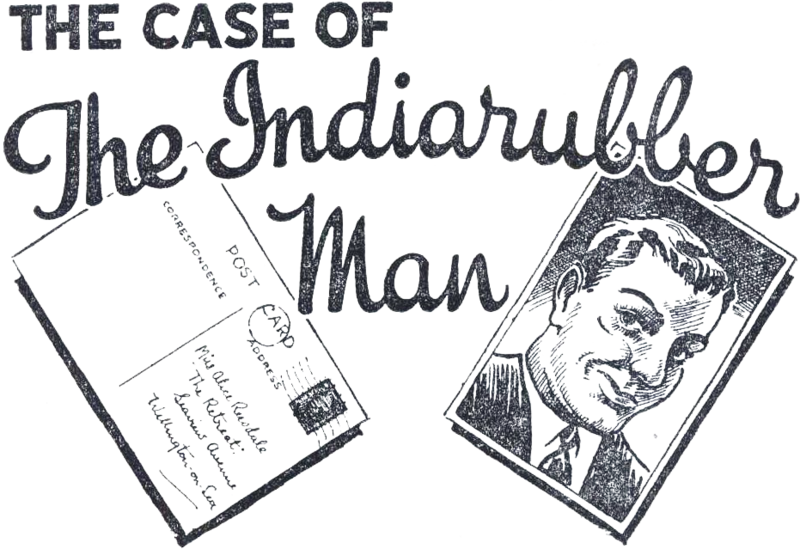 "Wheeler himself couldn't be the indiarubber man, and the latter's motive for murdering Miss Reesdale is quite strong." "Have you any theories, Mr. Hawke, as to where this man might be found?" asked Foster. Hawke was silent for a space, and the two gazed steadily at one another. "I have been trying to think," said Hawke, "what would be the most effective sort of disguise for a man with red hair and very loose-skinned, rubbery features, and I thought of the possibility of his dyeing his hair black and growing a Large beard, also dyeing that black, of course." Foster helped himself to a drink and sipped it. "That isn't too subtle for me, Mr. Hawke," he said. "I can guess your drift. You mean you suspect me." "It's a very tough beard," said Hawke smoothly. "Fair hair," he went on, "is the finest in texture. Black hair is somewhat coarser, and red hair is the toughest and wiriest of all." "It's not an invariable rule, though," pointed out Foster. "I hope you've a rather more substantial reason than that for making these insinuations, my friend." At this point there was a knock at the front door, and, glaring at Hawke, Foster moved out into the hall to answer it. Hawke stepped swiftly to the door of the drawing-room and watched his back as he was pulling open the front door. A startling development ensued, though it was only Foster who was startled. Outside the front door stood Tommy, who had just released the late Miss Reesdale's collie from its lead. The animal sprang into the hall, bounded up against Foster, placed its paws on his chest, and licked his Lace, wagging its tail the while. "Bruce, drat you, get down!" shouted Foster, and then stiffened as though suddenly realising that he had betrayed himself. "I sent my assistant round to the local R.S.P.C.A. officer to collect it for a little experiment," said Hawke. "I was vain enough to think it was making friendly advances to me this morning," he went on, "and was startled by its treachery in snapping at my hand when I tried to stroke it. As we entered the Retreat you passed by, and I realised that the dog had been looking at you, and not at me." "The dog recognised its master by his walk, his footsteps, and his scent," went on Hawke, "and, of course, was not deceived by the dye or the beard." "So you think you've now fastened the murder on me, do you?" gritted Foster. "I suggest that it was your shadow that P.C. Smith saw, and I also suggest that you are the only person who could have kept the dog quiet. Whatever its master did would be right in the animal's estimation, and you would only have to tell it to keep quiet and it would obey you." "You haven't proved a thing yet." "Perhaps not. But it's now up to you to disprove that you are Pryde. A simple chemical test of your hair — "
It suddenly became startlingly evident that during the interview the bearded man had been suppressing a tremendous anger, which now became too much for him to contain. Little further evidence of his identity was needed than that which was now forthcoming. The frightful expression which contorted his face established him as the wanted man beyond all doubt. He made a rush at Hawke, and the dog did the same. Tommy peeled off his jacket, threw it over the animal's head, and dragged it back. Hawke meanwhile found himself engaged in a strenuous and thoroughly disconcerting struggle. He seized one of his adversary's arms and bent it back into a position which would have rendered an ordinary man helpless. But there seemed no limit to the flexibility of the arm, and the man wriggled out of his grip seemingly without difficulty, at the same time throwing a muscular arm round Hawke's neck and heaving him violently on to his back. Aware of the snarling and scuffling in the background as Tommy struggled to hold the dog secure, Hawke continued the fight. He exerted all his strength in an effort to throw the man from a leg-hold, but failed. The man went over, but his body did not touch the floor, his arms, of which there seemed to be more than one pair, swinging round to save him. Then his body curled and twisted uncannily, and he thrust the sole of his foot in Hawke's face. When the detective, dazed and bleeding at the nose, picked himself up, he saw the other flying out of the front door. Hawke paused for a moment to help Tommy to tie the arms of the jacket round the snarling, frantically-struggling dog, and then the pair of them rushed off in pursuit. A car engine had started up at the side of the house. A splintering crash indicated the smashing of a garage-door, and then they were nearly run over as the car flew down the drive. It was an open car, and both of them managed to get a grip on the side of it as it flashed by. The vehicle lurched crazily out into Seaview Avenue, and then Hawke attempted to deflect the steering-wheel while standing on the running-board. Tommy meanwhile climbed into the back seat and threw his arms about the man's powerful shoulders. "Better jump, you fools,'' screamed Pryde, alias Foster. "I killed her, and this is the end of me. I'm going to drive over the cliff!" He put his foot down on the accelerator, and, at the same time bent back his left arm at an unnatural angle and heaved Tommy clean over the side of the car. They had left the road, fortunately for the youth, and he pitched in a clump of gorse on the ciifftop. Hawke saw the moonlit cliff's edge rushing towards him at a tremendous pace, and then he jumped. The car's momentum carried him on, and he came down within a few feet of the edge, and then slithered along until his legs were kicking out into space, when his desperately-clutching fingers found some roots. As he hauled himself to safety he heard a succession of metallic crashes as the car hit a series of rocky ledges, and then a splash. "I'm all right,'' said Tommy as he joined his employer, "but I reckon Pryde had a fall — sorry, no pun meant, sir — that ought to prove too much even for an indiarubber man." Wheeler was released as soon as the bearded man's body was recovered from the sea some hours later.